The Picnix vision is to pioneer the alfresco dining industry in Vancouver in a new and innovative way. By exhibiting sustainable business practices, Picnix brings awareness to local food and green initiatives, while showcasing Vancouver's natural beauty. The Picnix unit contains seasonal foods and reusable dining ware. Our handcrafted wagons have everything you need for a fun day in the Park, including a picnic blanket, pillows, sun umbrella and outdoor games like bocce ball. 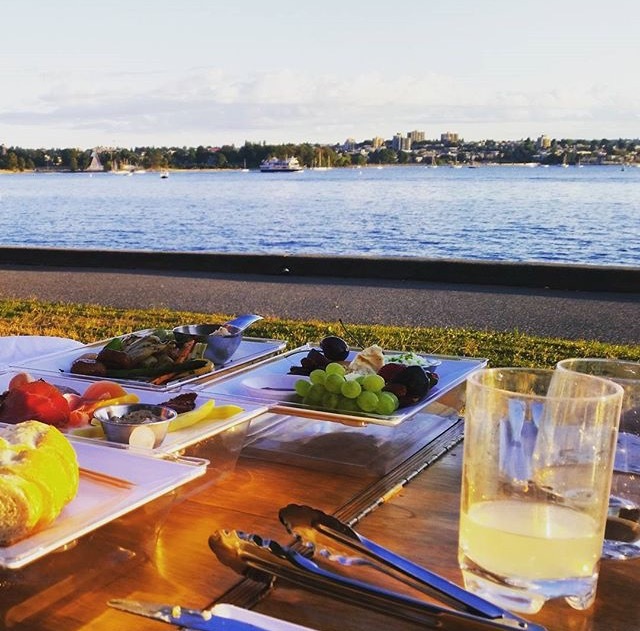 "The perfect way to Dine in Stanley Park,"
"Should be in the Top Ten of things to do in Vancouver"
Our handmade Picnix wagons stuffed with a five course tasting menu for two featuring salads, local cheese, charcuterie or antipasto with a cheesecake for dessert. Comes with lemonade and water, side plates, cutlery, linens, water resistant fleece blanket and pillows. The Picnix 'Wagons' are available for pick up at English Bay for our weekend sunset service. Providing our share plate menu, you can tote the wagon down the seawall to your chosen waterfront location. Bocce ball and game rentals also available. A summer picnic in the park without the hassle of shopping, packing and cleaning. An entirely sustainable experience using BPA free reusable plates and glassware, linen napkins and no packaging waste. Handcrafted wood wagons filled with locally sourced foods unfold into a table for two. Come see me to pick up your wagon in Stanley Park to enjoy your choice of prime locations in the park or on one of the world famous beaches. Water resistant, hand-made fleece blankets and pillows are included, so you will be comfortable wherever you set up. Treat yourself to our menu of all locally sourced food including fresh salads, a selection of charcuterie meats, artisan cheeses, and a vegetarian antipasto platter. Then finish with a delicious cheesecake with chocolate mousse and fresh fruit. There’s also fresh lemonade and water to quench your thirst! How could we make this better? Add bocce ball and a patio umbrella that attaches to the Picnix unit to stay cool in the sun. We are also working on prototypes for the Picnix unit to be towed behind bikes! Come support a local start-up and experience the new and inventive way to dine al-fresco. Our menu's are created in cooperation with local farms and businesses. Do not hesitate to get in touch. We're here to answer any questions you might have about our service, our sustainability or our menu. Please email picnixvancouver@gmail.com, or fill out the form below, and we'll be in touch in a timely manner.